Hypertension in children is not as common as in adults and its prevalence in the pediatric population is about 3–4%. Recent reports have highlighted an increasing prevalence of childhood hypertension, likely due to childhood obesity. Given the global burden of hypertension, identification and management of primary hypertension is beneficial to the individual child and has important implications for society as well, particularly since tracking studies have established that adult primary hypertension has its antecedents during childhood. 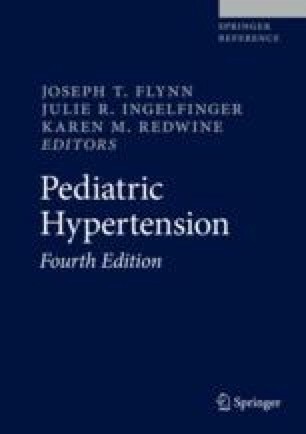 Studies on the pathophysiology of primary hypertension in children are limited; however, evidence suggests that the proposed multifactorial and complex genetic, environmental, and biological interactions involved in the development of hypertension in adults provide a basis to understand hypertension in children as well. In comparison to younger children who mostly have secondary hypertension, primary hypertension is much more common in adolescents. Primary hypertension is diagnosed in children after a selective workup to rule out any underlying secondary causes. Early identification and management of elevated BP in the pediatric population is important to decrease the risks for end-organ injury in both the pediatric and adult population.